Each fortnight I've been collecting 80's U.S.comics from the charity shop I visit .However in the past few months I have picked up some U.K comics as shown in the first pic. The Playbox comics I got from a car boot sale with 5 books and a couple of old magazines , one of the books being The Golden Book of Comics and all for £2. 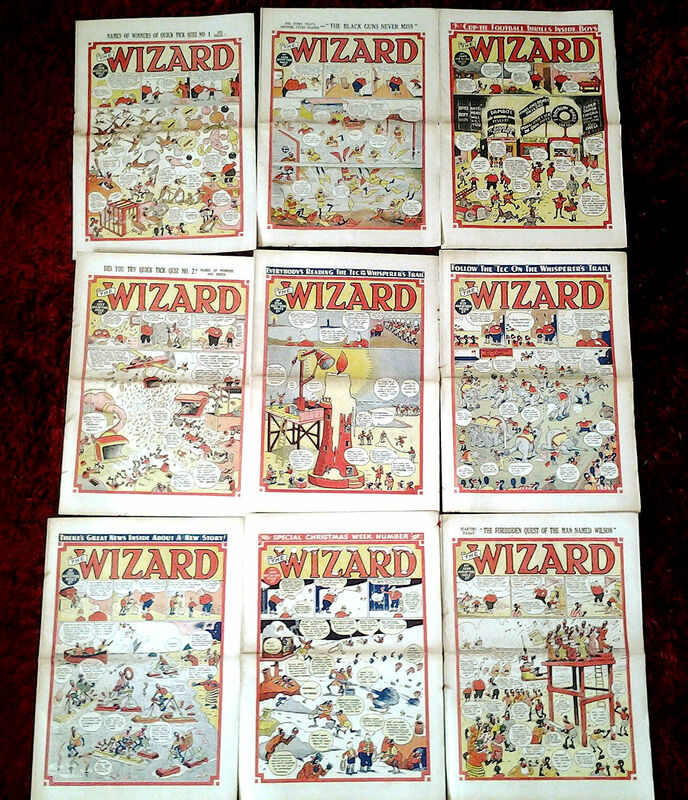 The two Wizard comics came from a charity shop at 50p each , they had a few more of these but I just wanted a representation. The second pic shows some reprints I bought . 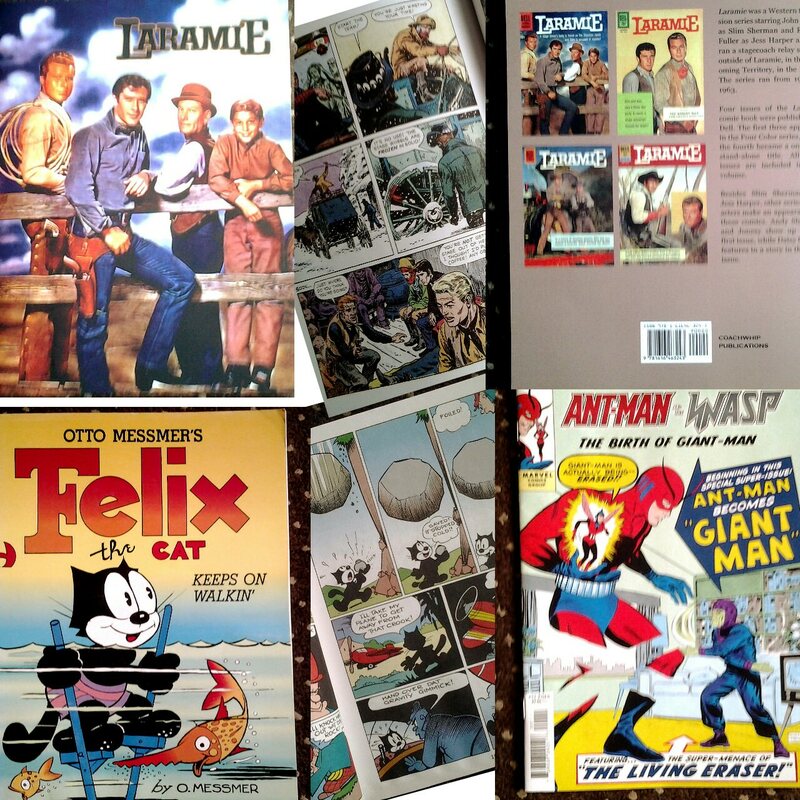 The Laramie book comprIses of four 60's Dell comics as shown on the back cover in pic, these are reprints of the complete comics including covers, the book containing no introductory notes which is also a good thing. I got this from a charity shop for 99p. The 130 page Felix book 50's reprints cost £2.50 from a charity shop. lastly in new comics there are bargains to be had ,the Ant Man reprint comic from ForbIdden planet as a $1.00 price tag the store charged me 75p. If you've managed to read all this you deserve a medal. All I know is that is on the outskirts of the city. May have to have a hunt. Last edited by abacus on 12 Jun 2018, 11:24, edited 5 times in total. Clarendon Park is a name I haven’t heard for a very long time! I lived there for the 2nd of my 4 years at Uni. I probably wouldn’t recognise the place 30 odd years on! Why did you need four years at university, Adam? My Honours degree at the University of Birmingham in Spanish, Portuguese and Latin American Studies with French as my subsidiary subject was completed in three. I did stay there for a fourth year but that was in the Education Department, learning how to teach successfully. 1 year Post Grad diploma in what used to be called Personnel Management. Right, thank you, Adam. My equivalent would no doubt have been called Pupil Management had there been any such component. The only one I remember would be best described as 'Sink Or Swim'. I had two periods of teaching practice. The first was for three weeks at Handsworth Wood Secondary Modern School, where I had to teach more or less any subject other than Spanish or French. The preparation I had to do for those classes was hard work. The second was for ten weeks teaching mainly Spanish with a handful of French classes at Churchfields Comprehensive School in West Bromwich, which was altogether more enjoyable. Ah now I know may pop in and have a look tomorrow as am off. Don't forget there are two loros shops on Queens road a few shops apart one books, one music. The book shop also as a shelf containing graphic novels and comic reference books but these although cheap enough are usually more than I want to pay.The shop across the road as a similar comic book shelf. I'm a poundshop type comic collector just seeking bargains for my collection but I am aware some are more into buying and selling for profit .I saw a Tip Top annual 1952 in a second hand book shop, which I thought if it was a tenner or less I might be interested in buying but looking inside the price was £30 ( I thought the're having a larf!) since I already have some Tip Top annuals bought from carboot sales for a £1 or less. Even the chap on the wednesday market likes the £20- £30 for annuals. I guess too many car boot sales and poundshop visits have had a bad effect on my pricing radar. 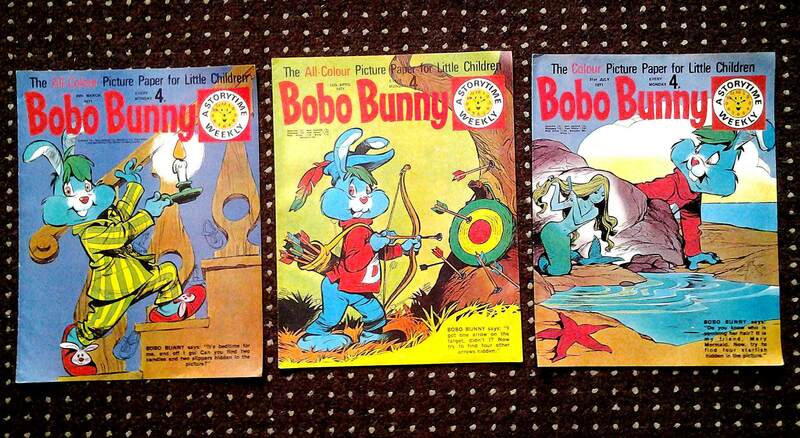 Several months ago , the Sue Ryder shop in town had a box full of Bobo Bunny nursery comics which I gave a passing interest to but wasn't interested enough to buy any. Thereafter on other visits to the shop I haven't seen them on display. Mysteriously today they were back in the shop. As a collector I thought maybe I should have some examples of these although they are not my normal type buys. and 3 additions to my collection that seems a good deal. The day before I went on holiday my son came around and told me he had ordered me some comics.He doesn't know a lot about comic collecting and doesn't always choose comics that I would select but then again freebies are freebies so I shouldn't complain. 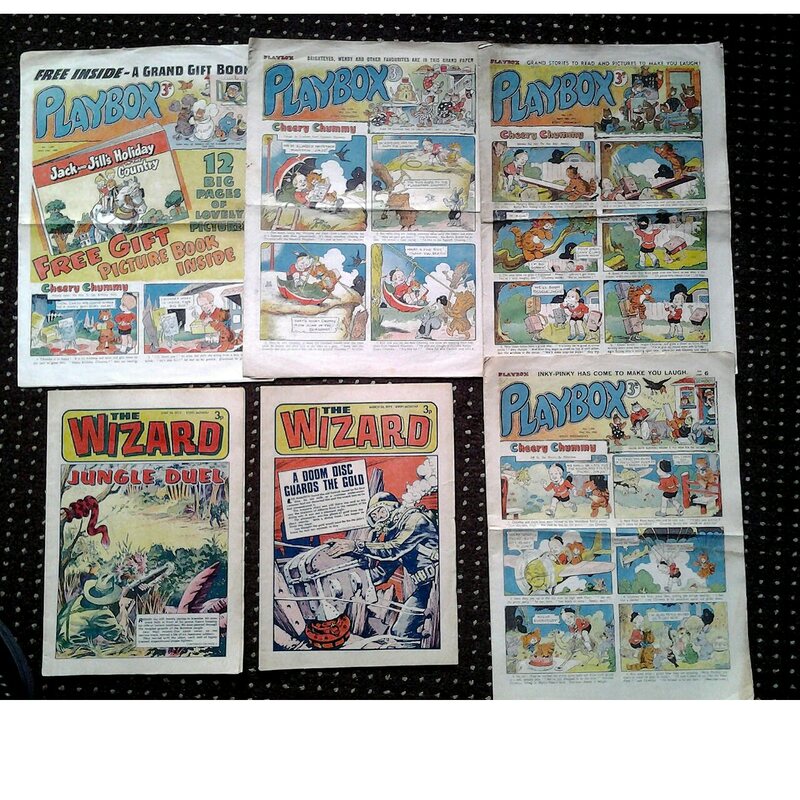 When I arrived back from holiday the comics had been delivered , they are 1949,1950 Wizard story comics as pictured. 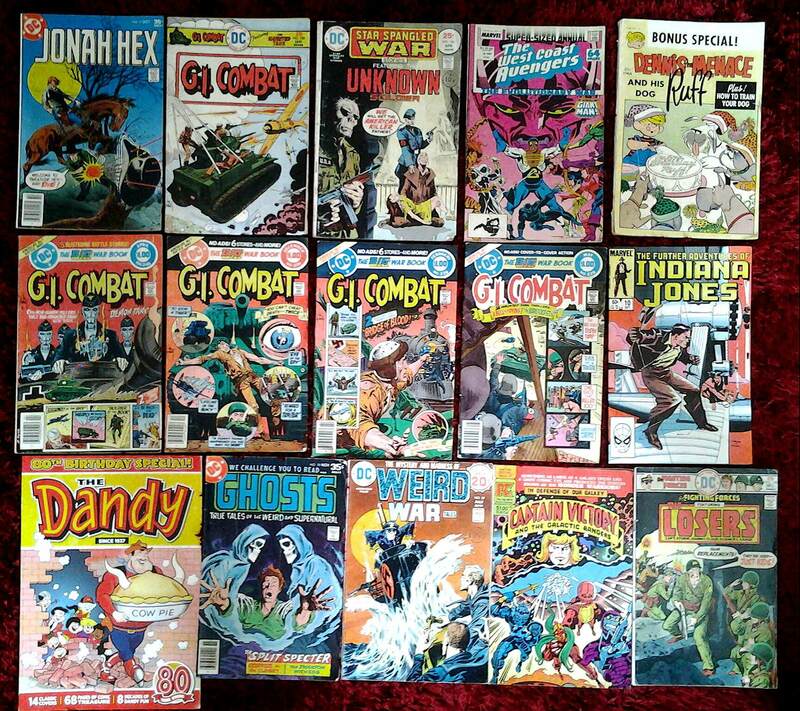 On holiday I found comics for sale in Exmouth indoor market .I concentrated on two bargain £1comic boxes the stallholder had and spent a massive,gigantic £14 on 14 comics, as shown. While I was flicking through the Captain Victory (Pacific Comics) comic impressed with the artwork the stallholder told me it was by Jack Kirby in his later years. The Dandy birthday special I got from a Exmouth charity shop for 50p. Lots of comics to read plus I have loads of non-fiction books on my tab to read. Marvel True Believers series new budget comics for less than a pound from ForbIdden planet .Bought two yesterday at 75p each , could have chosen some Wolverine comics .These comics with the distinctive tops are easy to find in the store. Why have I mentioned them ? (a) because I like some of the old reprints . 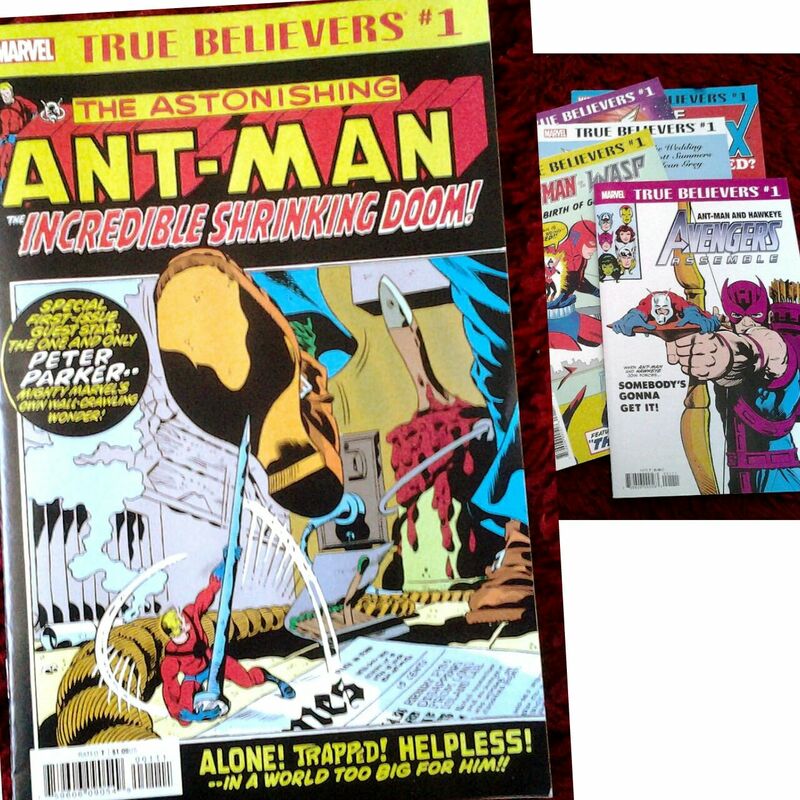 (b) I think the Ant Man cover art is fab. (as shown)top two bought yesterday.